Larry Sultan, Dubai Hot Tub, 2005. Courtesy The Estate of Larry Sultan and Casemore Kirkeby. Among the things I miss most about Larry Sultan — and there are many — are the talks that we used to have. Often highly speculative, these could take place almost anywhere, ranging from a quick encounter at a party to a more sustained conversation over lunch or in a classroom with students. I found these moments exhilarating and fun, as I think Larry did as well. We engaged in them knowing that we often didn’t really know what we were talking about. I recall that at the end of one of these sessions Larry laughingly said, “If someone were listening to us they might actually think we knew what we were talking about.” But of course this position, this “not-knowing,” was central to Larry’s practice as an artist, a teacher, and a conversationalist. It was through a kind of probing that he came to understand things. He could accept the idea that knowing is both contingent and provisional — perhaps he even insisted on it. So it is in this spirit that I want to speculate on Larry’s photograph from 2005, Dubai Hot Tub, which he made as an editorial assignment for Wallpaper Magazine. But first I’d like to offer a more general statement about this “not-knowing” — or perhaps what is better described as ambiguity — that ripples through so much of his work. Usually it takes the form of what I will call “relational confusion,” a condition in which we, the viewers, find ourselves unable within a photograph to fully account for the relationships of the individuals to one another or, in some cases, for the context in which we see them operating. This condition exists to some degree in his earlier bodies of work, such as Pictures from Home, but becomes far more explicit in his later photographs, as exemplified by pictures like Dubai Hot Tub. This photograph, which is both funny and strange (two of my favorite aesthetic categories), places us insecurely and spectacularly on a merry-go-round of relational confusion. Briefly, let me try to explain what I mean. First, it is a picture of disparate and almost irreconcilable types: the three workers involved in some task related to the tree; the beautiful woman in the chair; the woman sprawled somewhat awkwardly in the hot tub; and finally the woman sheathed conservatively in black, who we eventually notice reflected in the mirror at the back of the room. All looking in different directions. All separate from one another, as if occupying other worlds while existing simultaneously within a delirious interior that is as indecipherable as the people in it. Less important, perhaps, but nonetheless interesting to me is the overall flatness of the lighting: with its lack of discernible shadows it adds to the overall weirdness of the scene by creating the odd impression that the squatting worker and the man standing next to him — his face partially obscured by the foliage — are as flat as the bizarre, incongruous desert scene behind them. It’s almost as if they are part of the mural rather than standing in front of it. Finally we arrive at what I think of as the real crux of the photograph and its central mystery: the figure in black, reflected in the mirror on the back wall, which also reveals the face of the bather in the hot tub, a fragment of the worker tending the tree, and the back of the woman luxuriously seated in the foreground. For me, this is the photograph’s most exciting moment of discovery. If (like me) your initial reading had you assuming that the seated woman was looking toward the man working on the tree, you now realize your mistake. Suddenly it’s clear that the object of her gaze stands off-camera, out of our immediate view. We can only come to her through her reflected image at the opposite end of the room. The mirrored view, compressing and reversing the action before us, is like a photograph within a photograph. In a sense, we are forced to look back into the mirror so we can look forward, following the gaze of the seated woman, which extends to a person standing beyond the range of the photograph. We ask: Who is this woman in black and what is she doing? We are left with a set of questions. And no definitive answers. Now I want to leave you with an idea that came to me while looking at and thinking about Larry’s photograph. 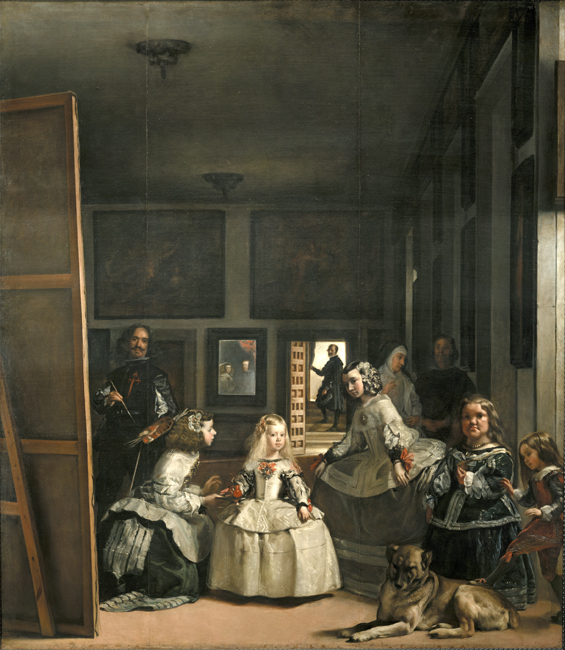 Diego Velázquez, Las Meninas, 1656. Courtesy Museo Nacional del Prado. These circles of looking that I’ve been trying to describe in Sultan’s photograph that utilize mirrors and the disparate gazes and positioning of the picture’s inhabitants, which send us ricocheting in and out of the confines of the photograph, have a direct connection to Velasquez’s remarkable Las Meninas. Just briefly I ask you to notice how the painter, presumably Velasquez, appears to look out at us from behind the painting he is working on. Not until our eyes come to the mirror in the back of the room do we notice that he is not looking at us, but the people caught in the mirror, his subjects: King Phillip IV and Queen Mariana of Spain. As in the Sultan photograph a dislocation occurs that thrusts the occupants of the foreground, who stand beyond the limits of the picture, into the background where they are reflected back at us. In the case of Las Meninas, they appear to be occupying the very space we are standing in as we view the painting. Of course, I can’t know if Larry was thinking about Las Meninas when he made his picture. Probably he was not. That’s not the point. The point is that Sultan’s photograph, like Velazquez’s painting, sends us along circulating paths of inquiry that fold back on one another without any certain resolution. He does this with both mischievous humor and great generosity, in that he allows us the adventure of discovery. Sultan, like all good artists, understands that the crucial gift of art is not to command the viewer or provide answers, but rather to create a lively space in which our liberated imaginations can meander freely, fully engaged in the poetics of looking. “Larry Sultan’s Relational Confusion” was adapted from a talk given at “Study Hall: 10×4 on Larry Sultan,” May 4th, 2017, at SFMOMA.